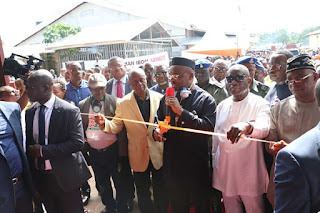 As part of activities to mark the second year anniversary of his administration, Governor Udom Emmanuel of Akwa Ibom State Monday commissioned a toothpick and pencil factory. 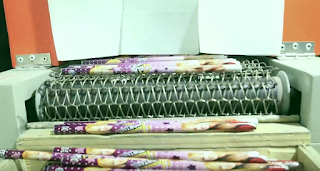 Commissioning the pencil factory established through the Akwa Ibom Empowerment and Entrepreneurship Scheme, AKEES, Governor Emmanuel said plans were on by his Government to ensure all consumables for the free and compulsory education scheme in schools are produced in the state. Emmanuel who said it was shameful for the country with a population of more than 170m people to be importing toothpicks, described his toothpick and pencil manufacturing technology as the most environmental friendly in line with the impact analyses carried out. He said his administration will unveil more in terms of production of plastics as well as medical consumables for primary and secondary health care. The Governor said that Akwa Ibom had taken the lead in pencils production because projections had suggested that Nigeria will only start producing pencils in 2018. Governor Emmanuel assured that he would not be daunted by critics as he was more interested in bringing results to the benefits of his people in line with the promises he made. “When we started this project, some people said it was one of those groundbreakings, but today we can all see the project become reality. People don’t know that groundbreaking is the first step towards industrialization,” the Governor added. The factory is located at Ekom Iman in Etinan Local Government Area. The Governor also commissioned a 1.5km outfall drainage project at the Nsikak Eduok-Tropicana Entertainment Center axis of the State Capital, flagged off an Emergency Medical Response Training Programme, the Modern General Hospital for Uyo Metropolis at Ituk Mbang, a 3.2km Dual Access Road at University of Uyo main Campus, a road network at College of Education, Afaha Nsit as well as 9.76km ancillary roads in Nsit Ubium.